Consecuencias de la fluoración del agua potable en la salud humana, más allá del alarmismo. Rev. Clin. Periodoncia Implantol. Rehabil. Oral Vol. 12(1); 06-07, 2019. Cephalometric norms related to Facial type in eugnathic Chilean adults. Rev. Clin. Periodoncia Implantol. Rehabil. Oral Vol. 12(1); 08-11, 2019. 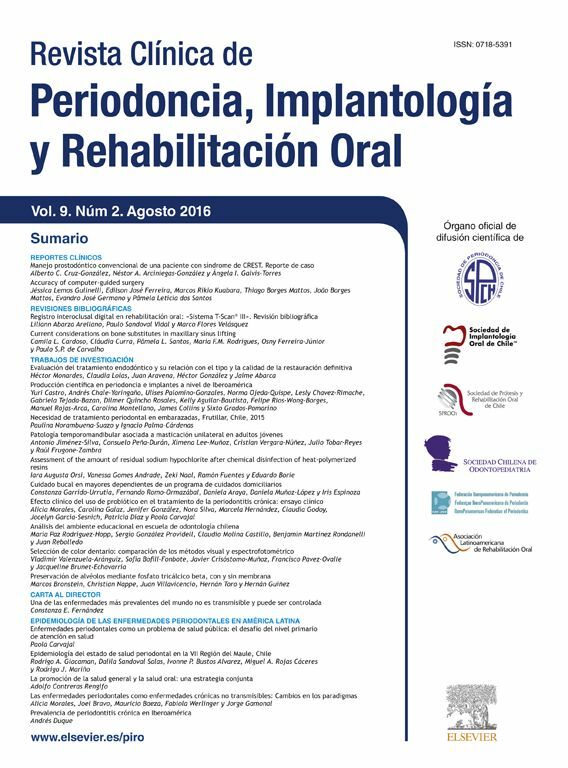 Caregivers knowledge on oral hygiene in elderly residents in geriatric establishments of longterm care, Valparaíso. 23 years of dentofacial deformities patients treated in a tertiary referral hospital in chile. retrospective study. Rev. Clin. Periodoncia Implantol. Rehabil. Oral Vol. 12(1); 15-18, 2019. New Method to Predict Mesiodistal Diameter in Unerupted Canine and Premolars Crown. Pilot Study. Rev. Clin. Periodoncia Implantol. Rehabil. Oral Vol. 12(1); 19-22, 2019. Knowledge, behaviors and motives in preventive methods for ororeceptive sexual practices in dentistry students. Rev. Clin. Periodoncia Implantol. Rehabil. Oral Vol. 12(1); 23-26, 2019. Knebelman craniometric method: clinical modification to simplify the determination of the Vertical Occlusal Dimension. Rev. Clin. Periodoncia Implantol. Rehabil. Oral Vol. 12(1); 27-30, 2019. Contents of cariology taught by Chilean dental schools: Cross-sectional study. Rev. Clin. Periodoncia Implantol. Rehabil. Oral Vol. 12(1); 31-36, 2019. The influence of cortical perforations on guided bone regeneration: A literature review. Rev. Clin. Periodoncia Implantol. Rehabil. Oral Vol. 12(1); 37-40, 2019. Rev. Clin. Periodoncia Implantol. Rehabil. Oral Vol. 12(1); 41-46, 2019. Mandibular defects reconstruction: The use of an acrylic block as a space and contour maintainer of the oral tissues. Rev. Clin. Periodoncia Implantol. Rehabil. Oral Vol. 12(1); 47-49, 2019. Rev. Clin. Periodoncia Implantol. Rehabil. Oral Vol. 12(1); 50-52, 2019.